What’s the cell phone policy? To ensure a serene and relaxing experience for all our guests, we kindly ask that you silence your cell phone upon arrival at the spa and refrain from taking phone calls while in the spa. Please be courteous with your phone. Please arrive 10 minutes before your scheduled appointment time as you may be asked to fill out paperwork. If you are late, we may need to shorten your treatment to accommodate the next scheduled appointment. Arriving late will simply limit the time for your treatment, thus lessening its effectiveness and your pleasure. Your treatment will end on time so the next guest will not be delayed. The full value of your treatment will be charged. Your spa experience is your time and you should delight in it to the fullest. We ask 24 hours notice for cancellation of treatments. For appointments of 3 or more treatments (single or group) we require prepayment. Cancellations with less than 24 hours notice and no-shows will be charged. Yes, and gift certificates are a great gift. These may be ordered by phone or purchased at the salon. No cash refunds are given for gift certificates. 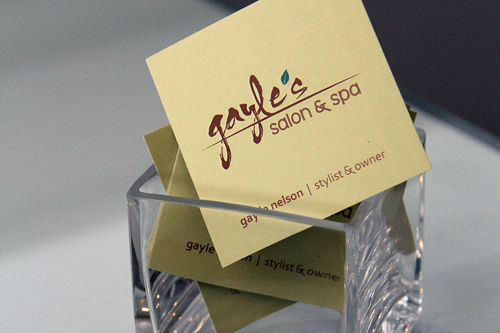 We gladly offer gift certificate transfers and credit toward all Gayle’s Salon & Spa services and products. What’ s the pricing policy? What should I wear for a spa treatment? We pride ourselves on being not being pretentious. Your comfort is our priority. We recommend wearing loose fitting, comfortable clothes or just wearing what you feel the most relaxed in. You will be asked to remove your jewelry, therefore we recommend leaving your jewelry at home so as not to forget it. What if I’ve never had a massage, facial or nail treatment before? No worries. Our expert staff will walk you through the treatment, explaining what you’ll be experiencing every step of the way from beginning to end. What about medical & health conditions? To better serve you, please let your therapist know if you have any of the following: pregnancy, muscle or joint injuries, heart condition, high/low blood pressure, diabetes, fever, contagious skin condition or any other medical issue. Also inform your therapist if you are using Retin-A, Accutane, or any photosensitizing or keratolytic medications, or have recently had laser or plastic surgery. Any of the above may affect our ability to treat you. What about communicating with my therapist or esthetician? At Gayle’s Salon & Spa we specialize in customized treatments that are based on each individual client’s needs. All aspects of our services can be customized, so please let your therapist know if you feel any discomfort or would like special attention to a particular area. Also, feel free to ask questions. The best experience always comes from honest, open communication with your therapist and esthetician. What if I’m not comfortable? This is your time and you should delight in the experience to the fullest. If you experience discomfort due to room temperature, massage pressure, music volume or any other conditions, please tell your therapist immediately. Can I go to the restroom during a treatment? Absolutely. Your therapist will ask you prior to your treatment if you would like to use the restroom. If at any time during the treatment you need to use the restroom again, just ask. Should I eat or drink before coming to the spa? We suggest eating a light meal prior to a massage. It is best to avoid drinking alcohol or limiting the amount of alcohol you consume prior to massage. Eating and drinking is perfectly fine prior to skincare and nail-care appointments. This is completely up to you. Many people choose to undress completely, others choose to leave on their underwear or wear a bathing suit. Prior to your massage or facial, your therapist will exit the room for you to get completely comfortable. During a massage treatment, we use a draping technique in which the therapist will use a sheet to cover the entire body except for the area being treated. During your facial, you’ll be wearing a wrap under the sheet that allows your neck, arms and décolleté to be exposed for treatment. At Gayle’s Salon & Spa, we massage the back, neck, head, hands, feet, legs, arms, décolleté and gluteal muscles. If you would like to skip any of these areas, just tell your therapist. Or if you’d like special focus on any specific area, let your therapist know that as well. This is your time and your experience and we pride ourselves on delivering customized treatments. Swedish massage is a luxurious massage technique that melts the muscles and the mind using long fluid strokes with varying pressure to improve muscle tone, circulation and joint flexibility. This type of massage is generally less intensive than a Deep Tissue Massage. A fusion between Swedish Massage and structural massage, our Deep Tissue Massage relieves aches and pains that are stored in the deepest parts of the muscles. This is perfect for working out knots and alleviating stubborn tension and soreness. Yes, this is a great time to get a massage. Give your sore muscles the treatment they deserve. The stones themselves are usually basalt, a black volcanic rock that absorbs and retains heat well, and have been smoothed by natural forces in the river or sea. First, the therapist warms up the body with traditional swedish massage, then massages you while holding a heated stone. As the stone cools, the therapist replaces it with another. The therapist uses many stones of various shapes and sizes, big ones on the big muscles, smaller ones on smaller muscles. What if the stones feel too hot? What’s the difference between waxing and sugaring? Waxing and sugaring are two techniques used to remove unwanted hair by removing the hair follicle from the root. Wax is hot and applied on the skin in the direction of the hair growth, then removed with a strip in the opposite direction. Wax is great for use on large body parts that are not sensitive, such as the legs, arms and back. It is also great for use on brows since it has an easy application process that can result in a high level of detail. Sugar is a water-soluble substance made from honey, lemon and water. It is warm and has a consistency similar to taffy. The esthetician will apply the sugar to the body part by spreading the sugar against the direction of the hair growth and then remove it in the direction of the hair growth, which results in less hair breakage. Although sugar is great to use on all areas, it’s especially good on smaller, more sensitive body parts since it does not adhere to live skin. It is most commonly used for bikini, Brazilians, lips and underarms. Sugar is easily removed with a wet towel and leaves the skin smooth and supple. Sugar is not reused. What do I wear after hair removal? Bring white cotton undergarments for areas treated. How long should my hair be for waxing or sugaring? For optimal results and a more comfortable experience, hair should be between 1/4″ and 1/2″ in length. If hair is longer, please trim to 1/4″ prior to your appointment. We will not wax or sugar guests who are sunburned, using Retin A (currently or in the past 3 months), Accutane (currently or in the past 6 months) Differin or any other medications designed to increase skin exfoliation. After hair removal, we recommend avoiding sun exposure and excessive sweating to lessen the chances of bacterial infection. Also, we recommend against shaving between waxing or sugaring treatments. Why did your salon choose Mirabella make-up? We chose Mirabella as their formulas were developed to meet the needs of all ages of women. Their oil free formula helps control excess sebum and it contains Vitamin C as a powerful antioxidant. Pure Mirabella is infused with natural essential vitamins and is mineral based. Unlike other cosmetics claiming to be pure, Mirabella does not contain harmful ingredients like talc, perfumes or synthetic preservatives. Beautiful and healthy for your skin, that’s Mirabella. How will my skin look right after a facial? You will leave with glowing skin. However, most facials come with extractions, so some redness may occur. Can I get a facial the day of an event? Yes, we do recommend facials prior to an event for even more beautiful skin. This facial would not concentrate on extractions, so be sure to let your esthetician know. If I’m taking medication for my skin, can I still get a treatment? What skincare line do you use? Bioline. We researched to find the best possible product line for our clients. Bioline is a family owned business based in Italy. This European skincare line just recently gained approval from the FDA and we are one of the first salons in America to be exclusive in using this fabulous skin care line. We are very proud of that fact. Yes, we have skincare products that are just right for your skin. Microdermabrasion is a modern technique that delivers a steady, effective stream of fine crystals directly onto the skin. This treatment erases epidermal layers in a safe, controlled manner leaving your skin soft, fresh and rejuvenated. How will I feel during Microdermabrasion facial treatment? Microdermabrasion is a comfortable and painless procedure; the smooth microcrystals we use do not cause any unpleasant sensations. Microdermabrasion treatment can be used to improve fine lines, superficial acne scars, congested skin, mild pigmentary problems and generally become part of an anti-aging treatment routine. Your consultation will be an opportunity to explore treatment solutions based on your exact needs. What are the benefits of a microdermabrasion facial? There are a few services that should be avoided during pregnancy, but many can be enjoyed. Please notify our receptionist if you are pregnant when you make your appointments so that we can offer guidance. We recommend bringing a pair of flip flops or open-toe shoes/sandals that do not touch your toenails. How long does it take my nails to dry? It can take your nails several hours to dry following a manicure or pedicure. It is best to wait before wearing closed-toe shoes for as long as possible after your service in order to protect the integrity of your nail treatment. Using Shellac Polish requires no drying time. VinyLux Weekly Polish and Weekly Top Coat are part of a system and are uniquely designed to work together. Patent-pending Prolight technology creates a powerful network of cross-linked polymer bonds that build resistance to chips and enhance durability with exposure to natural light over time. CND Shellac Power Polish is a breakthrough, patent-pending technology that combines the ease of polish with the performance of gels. No other products in the market can stand up to the their claims. 14+ Day Wear. Mirror Shine. Zero Dry Time. No Nail Damage. Yes, really! There is no damage to your nails as there are no drills or nail surface filing required. Are you a Shellac certified salon? Yes, all of our technicians have their individual certification. Some salons use Shellac, but are not certified in its use. This certification ensures that your service will be the best. Is CND Shellac formula “3-Free”? What is Brisa Lite Removable Smoothing Gel? This is a revolutionary Gel System that provides exceptional wear for three weeks with no filing of the natural nail! Brisa Lite Removable Smoothing Gel is the power partner of CND Shellac. It adds thin, flexible and lightweight protection to perfect and smooth the surface of the natural nail. It extends the wear of the CND Shellac service to 3 flawless weeks. Removable Smoothing Gel removes in 10 minutes with wraps and may also be worn alone for the ultimate natural manicure. Eyelash Extensions are semi-permanent eyelash extensions comprised of individual synthetic eyelashes that are curved to replicate a natural eyelash. Our lashes are thicker at the base and taper to a fine point. They are applied onto individual eyelashes, one extension at a time, for a natural, elegant look to lengthen and add fullness to the existing lashes. Eyelash Extensions are for professional application only. What do Eyelash Extension look like? Eyelash Extensions look and feel completely real. Each application is customized to suit the individual. We offer three thicknesses of lashes and four different curls and lengths. Eyelash extensions come in variety of colors for highlighting effects, but most people prefer black. Varying individual synthetic lash lengths are chosen to carefully replicate the shape and frame of your natural lash line. The thickness of the eyelash extensions is determined by the health and thickness of your natural lashes as well as your personal preference. The overall effect is added curl, thickness and length. What do Eyelash Extension feel like? Because Eyelash Extensions are the exact replica of an eyelash, they weigh about as much as a natural lash–practically nothing. You will not notice the addition of the extensions to your lashes and, importantly, they will not cause your natural lashes to fall out ahead of their natural cycle as other enhancement methods can. Most women choose Eyelash Extensions to lengthen their natural lashes while others want their lashes to look fuller. Women with naturally light colored lashes choose these to darken their existing lashes. Some love the different, fun looks they can achieve with highlighting and layering. Eyelash Extensions give the appearance of a brighter, more open and rested eye, creating a more youthful and rejuvenated look. The look can be maintained indefinitely with refills. Each lash will remain in place until the natural lash upon which it rests falls out, with a normal lash turnover cycle of 60-90 days. When a natural lash matures and falls out, a new lash has already been growing and replaces it without us noticing the turnover. This process is constant and at any given moment our individual lashes are at different stages of maturity. This cycle is virtually unnoticeable as we shed 1-5 lashes daily. To keep up with your natural cycle and maintain your beautiful lashes, Eyelash Extensions should be refilled every 2 to 4 weeks. It generally takes between 120 to 150 minutes to apply a full set of Eyelash Extensions. Touch-ups usually require 30 to 60 minutes. Can mascara be used with eyelash extensions? Our Halo Extensions have 70-120 grams (depending on the length of hair) of the finest quality Remy hair to add luscious volume and length to your natural hair. There are no damaging clips or glue and may be removed and replaced as often as you like. It’s so easy to add thick, rich body to your hair. Remy hair is the finest quality human hair available on the market today. Remy Hair refers to human hair that retains the cuticle layer, the outer most part of the hair strand, flowing in the same direction, the way hair does naturally. The delicate process which maintains this is the key advantage of Remy hair. It’s soft and silky, smooth and shiny, long-lasting and tangle-free. Will extension damage my hair? Can I color my Halo? Can I use heated appliances on my Halo? Yes, because Halo Extensions are human hair, you or your stylist may style as you would your own hair, this includes curling and flat ironing. Naturally, treat it as gently as you would your own hair. What are Hotheads hair extensions? Hotheads Hair Extensions are human hair, adhesive weft extensions that are applied without the need for tools or heat. They are designed to lay seamlessly and undetectable in your hair. Manufactured with 100% Remy hair, they be reapplied up to 3 times, while still looking and feeling amazing. Clients will get 8 to 10 weeks of wear from each application. Can you iron, curl or blow dry the Hothead hair extensions? Yes. It is human hair and can be styled just as you would style your own hair. Why are we a Kenra salon? For more than 50 years, Kenra has been formulating and producing hair care products using only the finest ingredients. Kenra is a privately held company and we take great pride in their approach to doing business. They are constantly doing research and development and working to discover innovative ingredients and results. Why do we carry Kenra retail products? Kenra products are distinguished by using a blend of pharmaceutical-grade and cosmetic-grade ingredients that provide extraordinary performance. Our products are highly recognized for reliable, consistent performance and have universal appeal and application. We encourage you to try our products. Kenra stylists have an in-depth knowledge of our products and their performance, and they will be happy to help you find the optimum solution for your unique hair type. We love Kenra! What is Brazillian Blowout treatment for your hair? Brazillian Blowout is a proprietary blend that provides superior performance and instantly improves the appearance of hair. Brazillian Blowout offers two formulations to meet the needs of both color and non-color treated hair. Both systems are gentle and deliver outstanding results for any hair type, length and texture. Can I bring refreshments my spa party? You may bring your beverage of choice and snacks to your spa party. Finger foods like fruit, cheese and desserts are some popular choices. We will provide glassware, plates and napkin. Please bring ice if needed. Absolutely. We offer the option of renting out the entire spa so that your party can be completely private and ensure that no other guests, other than those in your party, will be in the spa receiving services. Plus you’ll be able to choose your music, offer a wider variety of refreshments and have complete control over the noise level.